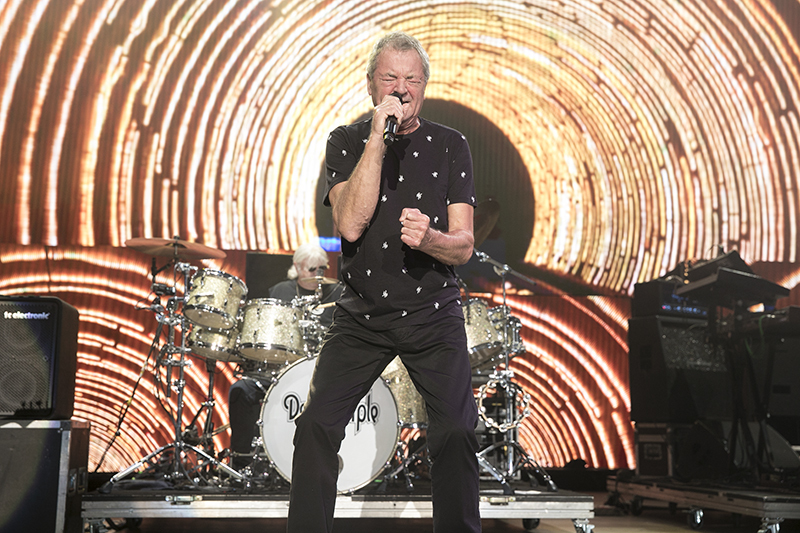 Rock and metal fans were treated to the rarest of experiences on a Saturday night at the Shoreline Amphitheater in Mountain View: a co-headlining bill from Judas Priest and Deep Purple, two of the most influential bands of all time. 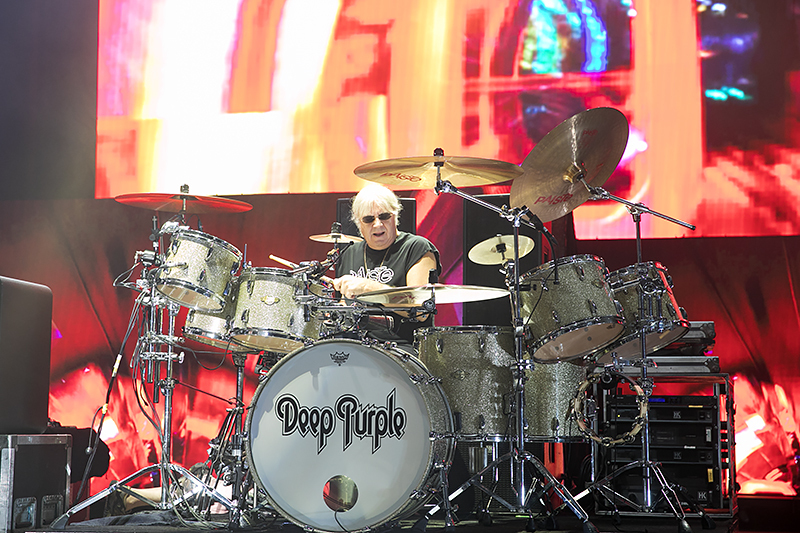 Deep Purple went on after Judas Priest, however both bands were given plenty of time to play full sets of music from across their varied discographies. 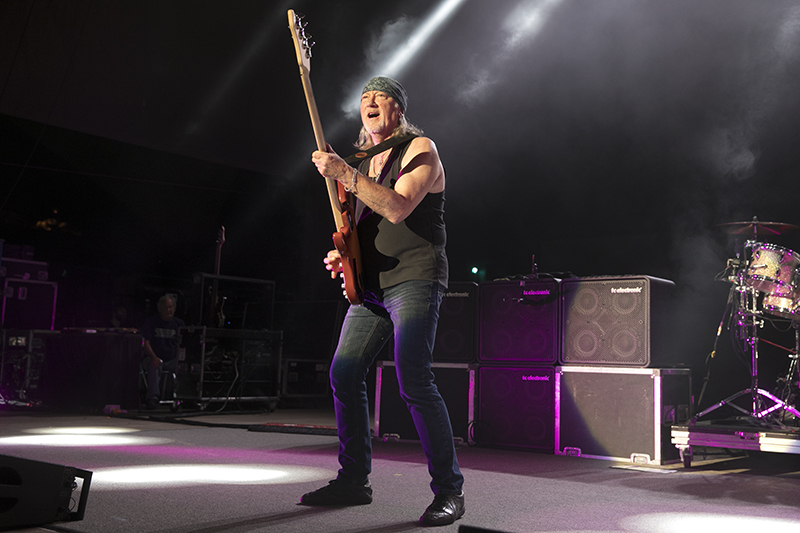 Deep Purple opened with the furious “Highway Star,” a song that was driven by a chugging guitar riff from Steve Morse and a slamming drum groove from Ian Paice. While the band may be in their 50th year of existence, they still delivered plenty of powerful moments. This was certainly the case on the following song, the rocking “Pictures of Home.” Driven by some tasty lead guitar work from Morse and some roaring vocals from Ian Gillian, the song also featured an impressive series of instrumental solos, with bassist Roger Glover delivering a sweet bass solo that covered the entire range of his instrument. The band kept on rocking with a particularly strong version of the old favorite “Bloodsucker.” The song rode a slamming atonal guitar riff that was played with some serious grit from Morse, who really stretched his legs during a lengthy mid-song guitar solo. Keyboardist Don Airey got plenty of time to shine as well, pumping out some fantastic melodies and solos. 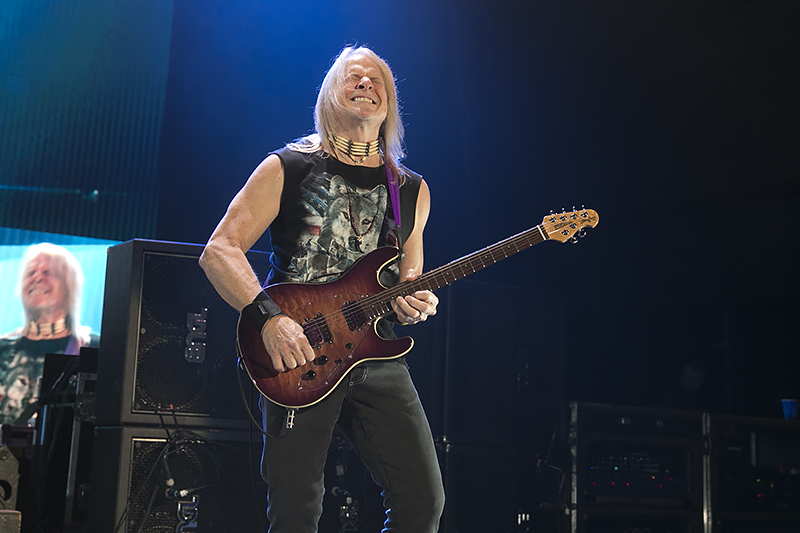 A few songs later, Deep Purple slowed things down for the ballad “Sometimes I Feel Like Screaming,” a deep cut from their 1996 record Purpendicular that was a showcase for Morse to show off his melodic side. The main melody of the song came from a beautiful lead guitar line, and the solo section was one of Morse’s best of the night. 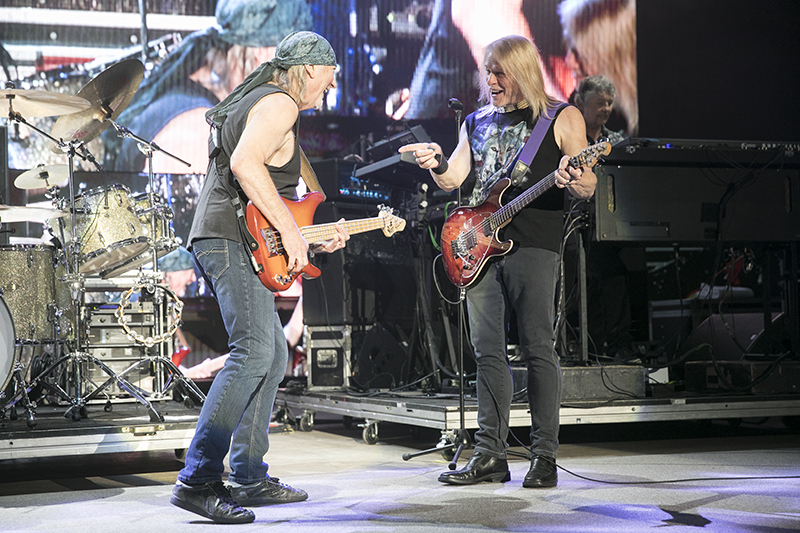 The band continued to roll through old classics as their set went on, closing out the main portion of the set with their most well-known track: “Smoke on the Water.” Featuring one of the most iconic guitar riffs in history, the song was a fantastic cap to a great evening. 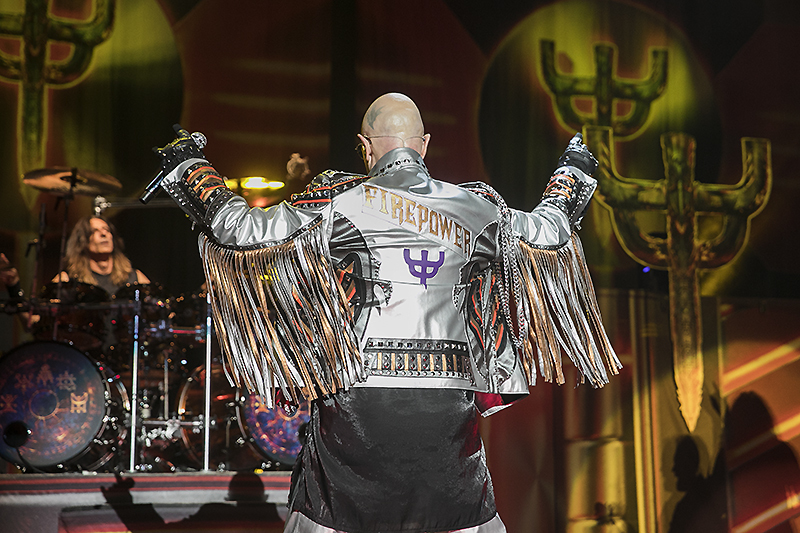 Few bands command the stage in the same way as Judas Priest, and this was certainly the case as the band strode onto the stage to a packed audience at the Shoreline with the opening fury of “Firepower” from their latest album of the same name. 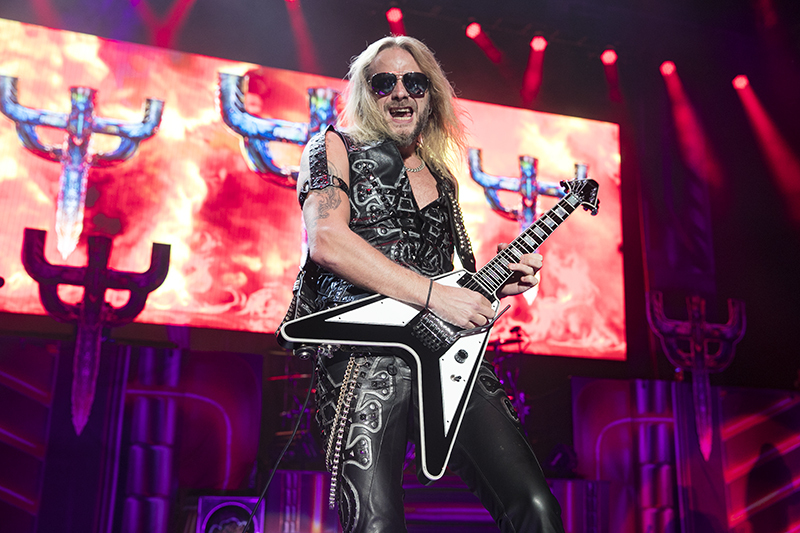 As usual, lead guitarist Richie Faulkner wasted no time in dishing out some furious guitar leads, whipping his Flying V around and adding in plenty of wild playing to the song. Next up was an old, seldom-played classic in “Delivering the Goods,” a bracing hard rock song that gave Rob Halford plenty of room let loose with a powerful vocal line. After a short break, drummer Scott Travis addressed the crowd before beginning the complex drum intro to “Painkiller.” Out of all the Judas Priest songs in their legendary canon, “Painkiller” is one of the best, and the band really delivered an amazing performance of it. From the get-go, Faulkner and Sneap were dialed in, charging through each section with ease. 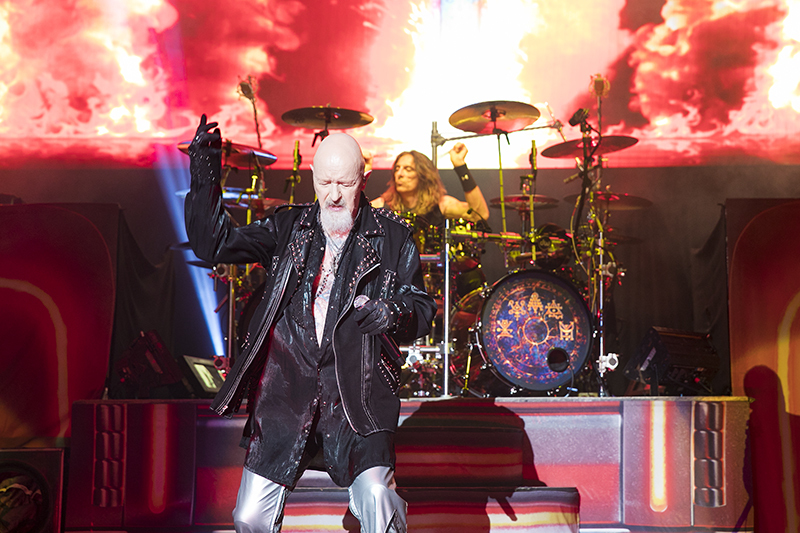 Halford stepped up his game on the song as well, delivering some of the highest notes in his register. 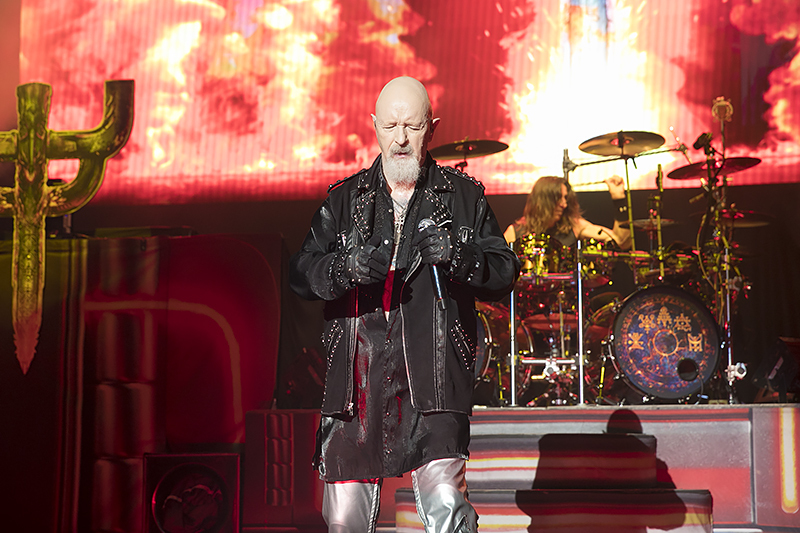 As has been the case on this tour, Faulker has taken over the entirety of the song’s solo sections, all of which contain some of the most technical and challenging runs of any Judas Priest song. None of that seemed to matter to Faulkner, who nailed each piece with blindingly fast runs. After a brief break the band returned for a three-song encore that included an awesome performance of “Electric Eye.” For the first time, Sneap got to handle the main lead in the song, dishing out an impressive solo where he was able to let loose and show off his considerable chops. 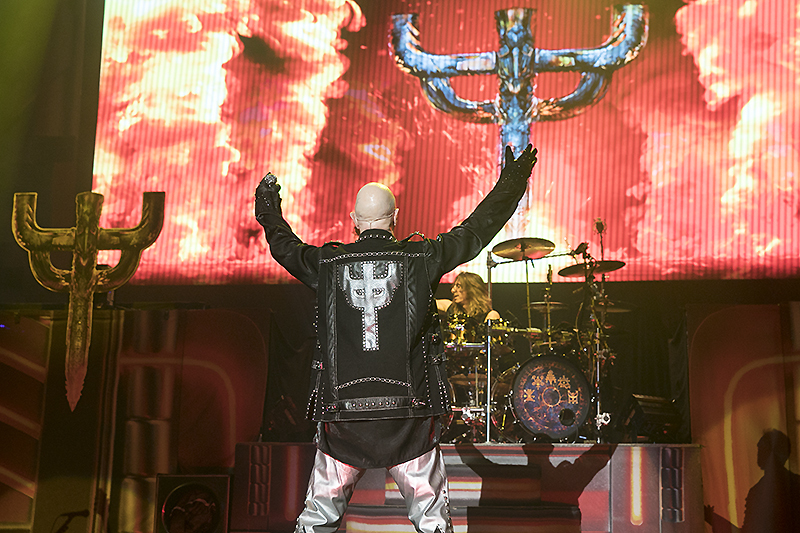 Judas Priest then closed out the night with the 1-2 punch of “Breaking the Law” and “Living After Midnight,” two iconic rockers that had everyone in the crowd singing along. 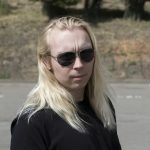 There is a reason the band is still revered by metal and rock fans even after all of these years: they simply deliver the best possible performance of these iconic songs in a live setting. 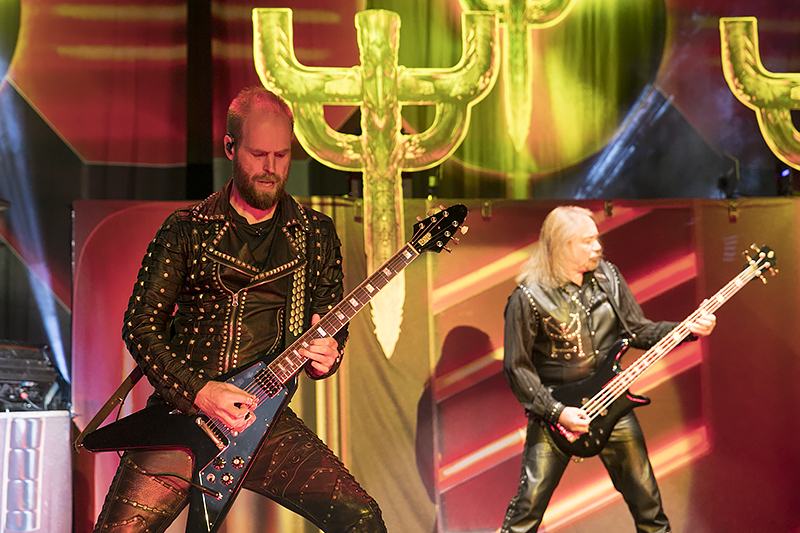 With a live sound that still levels the audience, Judas Priest remain one of the best live bands in the world. 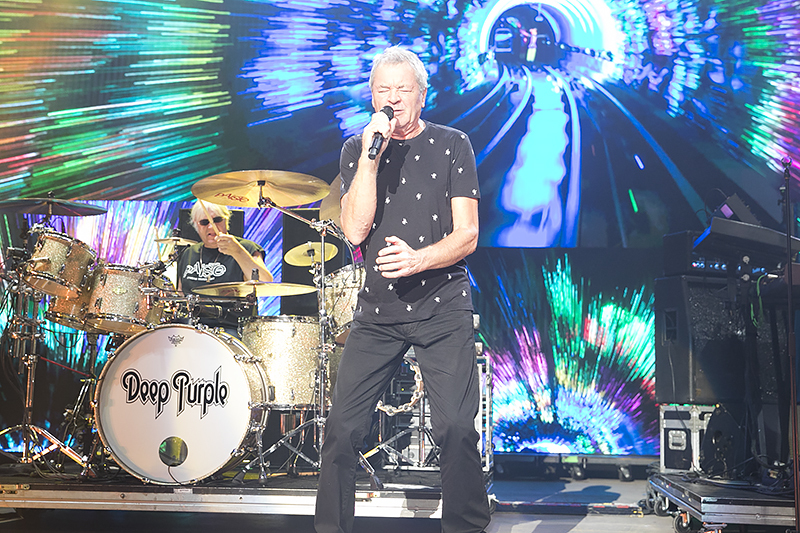 Find out more about Deep Purple here. 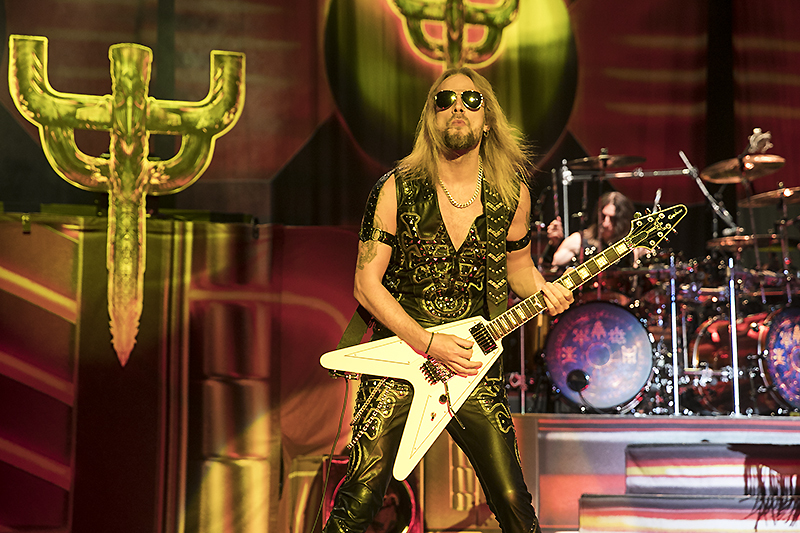 Get more info on Judas Priest here.